How much is Jenna Bush Hager Worth? 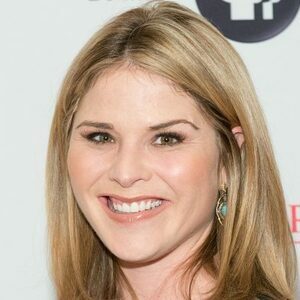 Jenna Bush Hager Net Worth and salary: Jenna Bush Hager is an American teacher, author and television news correspondent who has a net worth of $10 million. Jenna Bush (Hager) was born November 25, 1981 in Dallas, Texas. She is probably best known for being the younger of the non-identical twin daughters of the 43rd U.S. President George W. Bush and former First Lady Laura Bush. Jenna is a granddaughter of the 41st U.S. President George H. W. Bush and former First Lady Barbara Bush. She and her sister Barbara were the first twin children of a U.S. president. Hager is an author, an editor-at-large for Southern Living magazine, correspondent for NBC's Today Show and a contributor to NBC Nightly News. In 1994, after her father was elected Governor of Texas and the family moved to Austin, Texas, Bush was a student at St. Andrew's Episcopal School and attended Austin High School (1996-2000). She attended the University of Texas at Austin and took summer classes at New York University. While there, Jenna and her sister Barbara made national headlines when they were both arrested for alcohol-related charges twice within 5 weeks: on April 29, 2001, Jenna was charged with a misdemeanor for possession of alcohol under the age 21 in Austin, Texas. On May 29, 2001, Jenna was charged with another misdemeanor—attempting to use a fake ID (with the name Barbara Pierce, her paternal grandmother's maiden name) to purchase alcohol. She pleaded no contest to both charges. Jenna Bush graduated from UT Austin with a degree in English in 2004. Since her teenage years, Jenna went on to become a responsible teacher, author, news correspondent, wife and mother. Her wedding to Henry Chase Hager took place in a private ceremony on May 10, 2008 at her parents' Prairie Chapel Ranch near Crawford, Texas. On December 12, 2012, Henry and Jenna Hager announced on The Today Show that they were expecting their first child. Their daughter, Margaret Laura "Mila" Hager, was born on April 13, 2013 in New York City. Mila is named after her grandmothers. On April 8, 2019 Jenna began co-hosting the fourth hour of The Today Show with Hoda Kotb, essentially taking over for Kathie Lee Gifford. When she was given this new co-hosting job, her salary was bumped to $4 million.